In the mid-1980s, Douglas Adams’s career was firing on all cylinders. A comic writer since college, best known for his collaborations with Graham Chapman and Monty Python’s Flying Circus, he was writing for classic Doctor Who at arguably its creative height and had just launched the juggernaut that was The Hitchhiker’s Guide to the Galaxy. It was in this spirit that Mr. Adams, in conjunction with Steve Meretzky, created one of the finest and most famous of the Infocom adventures. This is the story of the other official Hitchhiker’s Guide game, the one scrubbed from store shelves to make room for the Infocom work. That game was written by Bob Chappell and published by Supersoft in 1981. I’ll be diving into the more famous game next week, but there is something tempting about playing a game that you aren’t supposed to be able to play and I just could not resist. I’ll give a basic introduction to the Hitchhiker’s Guide and Douglas Adams this week, focusing instead on the story of this “lost” adventure game; next week will have a proper introduction as part of the series on the Infocom game. 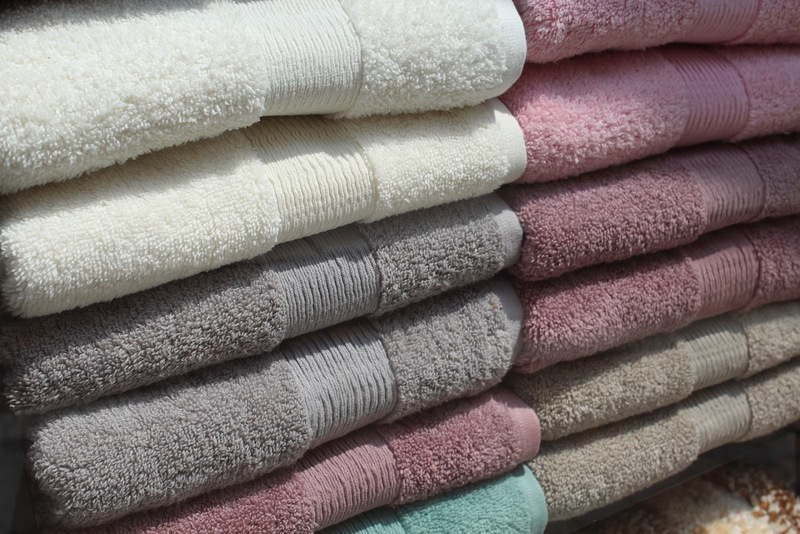 Grab your towel and remember to “Don’t Panic”. To hyphenate, or not to hyphenate. That is the question. In brief, if you are unfamiliar with the series, the Hitchhiker’s Guide isn’t your typical fantasy or science fiction series. It began innocently enough as a radio series on BBC Radio 4, the story of a young man who survives the end of the world thanks to befriending an alien researcher who had been stranded on Earth. The series is a comedy and if I tried to relate how he and his researcher friend (named “Ford Prefect” due to a slight misunderstanding when he was going undercover) end up traveling with the three-headed fugitive president of the galaxy in a ship powered by improbability, it wouldn’t make any sense at all. Nonetheless, the series was a hit and the BBC commissioned a second radio series. From there, in a span of only a few years, it was released as a pair of albums, a pair of novels (with more coming), and even a TV series. The world was beating a path to Mr. Adams’s door. That’s where we come to Bob Chappell. I have not been able to find out much about him except that he started programming professionally around 1980. His first game that I can find is a collection of minigames called Nightmare Park, first published as a type-in with the August 1980 issue of Personal Computer World. An expanded edition was subsequently published by Supersoft, although thanks to the game being a type-in numerous ripoffs were produced for a variety of platforms with other listed authors. 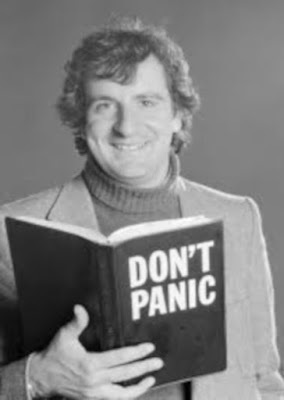 Mr. Chappell had the foresight to contact Pan Books and request the rights to make a licensed game based on the Hitchhiker’s Guide property. As this was 1980 or 1981, licensed games were almost completely unknown and they said yes. (In fact, this is almost certainly one of the first licensed adventures ever produced. I am not aware of an older one although one of our readers may be able to find one.) On May 9, 1981, Supersoft purchased the rights to distribute the newly-minted Hitchhiker’s game. The first release was for the Commodore PET, but ported to the VIC-20 and Commodore 64 in 1982 and 1983. Once again, Mr. Chappell was beset by knock-offs with several ports and re-releases of the game hitting other computer platforms with different names on the by-line. So who was Supersoft? Supersoft, a company founded by Peter Calver and Pearl Wellard, produced firmware and a “high-resolution” graphics board for the Commodore PET in the European market. This led naturally to the company distributing software for the PET (and eventually other platforms), including both games and productivity software for the young market. It was in this context that Bob Chappell approached them to publish his games, starting with Nightmare Park. They continued to work together for several years. 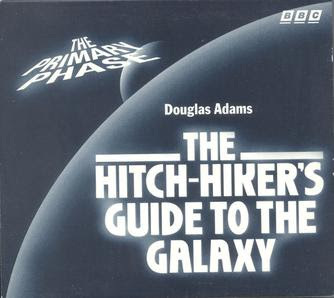 In 1983, two years after the initial sale of Chappell’s Hitchhiker’s Guide game, the company was contacted by Douglas Adams’s agent and taken to court to withdraw distribution of the game. As Chappell and Supersoft had received written permission from Pan Books, the book publisher agreed to pay all of the legal fees for the proceeding. Eventually, a settlement was reached where Supersoft would withdraw the Hitchhiker’s Guide game from publication and destroy any unsold assets. Bob Chappell and Supersoft re-released the game a few months later sans any Hitchhiker’s Guide elements as Cosmic Capers. I’ll have more to say about that version at the end of this post, although both versions have survived to present day thanks to archivists and “cracked” software BBSes in the 1980s. Bob Chappell continued writing games that rhymed, so to speak, with popular fantasy brands, releasing Cracks of Doom and Lord of the Balrogs in 1983. I’m not sure if the legal action scared him out of his chosen profession, but I have not been able to find any further games from him after 1983. Supersoft grew and thrived through the 1980s, purchasing Audiogenic Software and using that brand to distribute games throughout the rest of the decade. They are perhaps best remembered for Graham Gooch's Test Cricket, a popular sports game for the Commodore 64 and other platforms. Supersoft continued in the hardware and software business, selling high-end sound systems for Commodore platforms as well as business software before largely withdrawing from the market in the early 1990s. Peter Calver works today running a genealogy website in the UK called Lost Cousins; he has been very gracious in sharing his company’s story with me for this article. Permission: Once given, surprisingly easily revoked. Starting the game, we get the briefest note on what the plot might be: “explore, collect, and store certain objects.” That isn’t helpful, but there’s no manual so that is likely to be the best that I will get. What are the “certain objects” and where are we supposed to “store” them will hopefully be obvious as we play the game. On starting the game, we are immediately dropped into a small English village. Is this right before the destruction of Earth? 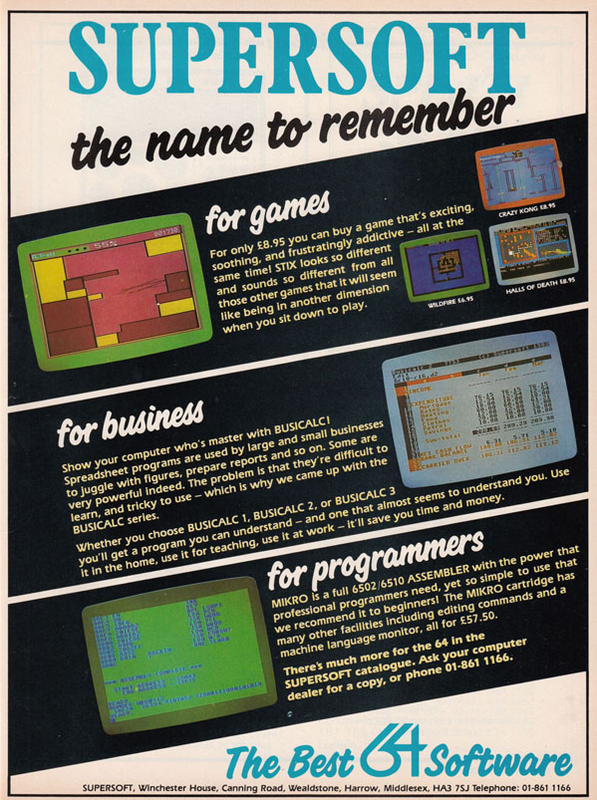 The game’s parser is a simple two-word affair, but that was typical of 1981. The Heart of Gold (the main spaceship of the series) is parked on the village green, at the northern end of the street. I can enter it, but I’ll put that aside for a few minutes as I map out the village. The southwest has a farmyard with a Vogon cruiser parked there. I try to explore, but a Vogon captain is blocking the way deeper inside. The southernmost point is a library containing a copy of the Encyclopedia Galactica. I pocket it. It’s not a huge area: the whole town is just nine rooms and mostly empty. I start dropping off items in the Inn, but there’s no indication that I’ve found any of the all-important artifacts. I am not even sure how long this game is. With the rest of the area explored, I head into the Heart of Gold. That isn’t huge either, except for a small three-room maze (the “Total Perspective Vortex”) which I map in the usual fashion to discover a cheque from Zaphod Beeblebrox at the center. In a control room, I find a lever labeled as “Do Not Pull” so naturally I pull it. That shoots me out into space and I die of asphyxiation in a few turns. If there’s anything to do in space, I cannot find it. A store room contains a Kill-o-Zap gun and a stake and I try to pocket both, but I’ve run out of inventory space so I must shuttle stuff back and forth to the Inn. It seems that your inventory limit is based on weight; sometimes I can carry four items while other times I can carry one or two more. My map of Earth. Red circles are puzzles that I know of that I have not solved. What’s left to explore? I head back to the Vogon ship and shoot the captain with my gun. That seems violent and not very “Arthur Dent”, but I’m pretty sure at this point we aren’t playing as Arthur or at least the circumstances of the game are completely different. Actually, I should say that I fail to shoot the captain with the gun because I have to turn it on first and cannot find any command to do that. I try “activate”, “load”, and a half-dozen other combinations but eventually give up. I was thinking of ending here, but that would be a lame review so I found a walkthrough online. The command that I needed was “on gun”. Rule change! Given how stupid that command seems to be and how… finicky the parser is, I’m going to consult the walkthrough whenever I get stuck. I’m still going to try to solve the game myself, but I’m not going to spin for hours over a parser glitch. Sorry if that disappoints anyone. I shoot the captain correctly this time and am free to explore his ship. To the east is a torture chamber containing a book of Vogon poetry while there is a locked door to the west. Fortunately, while I am exploring, a random Vogon appeared and I shot him. Well, I shot him the second time. The first time, I let him shoot me and I somehow am teleported into space where I die. Frankly, I think a teleport gun is a bit overkill when a bullet will do, but there doesn’t seem to be any way to steal it from him. In all of this shuffling, I discover keys on the ground and they unlock the Vogon control center. Completely by luck, I read the book of Vogon poetry in that room (I was stuck!) and that activates the ship, taking us to Krakafoon. This is a minor planet from the second book, but I don’t recall anything about it. Any commenters with a better memory than I have? Just outside the Vogon ship is a Bugblatter Beast of Traal and he’s blocking us from advancing any further into the planet. Unfortunately, this is where I realize that I made a mistake: I restored back to grab a few items to try on him, but when I get back to the Vogon ship, I fail to get the keys and cannot open the door. I shoot Vogon after Vogon but none of them dropped the key I had seen before. I eventually have to read the walkthrough and I realize that I completely misunderstood what was going on: while I was mucking around, I had been carrying the bowl of petunias. I dropped them to collect the book of poetry, but the keys-- for absolutely no reason-- appear when you drop the bowl. I assume we are supposed to imagine that the keys were in there the whole time, but you can’t see them when you “look” and there is no message when they fall out. That makes two silly trips to the walkthrough. While glancing through and trying not to be spoiled, I learn about the “score” command and use it to tell that I have zero points despite every object I have found so far being deposited in the Inn. This could be a while. Where was I? 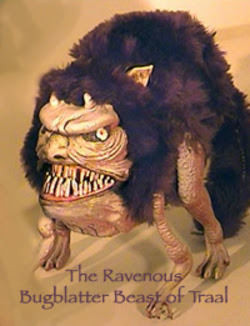 Right, I was trying to figure out the Bugblatter Beast of Traal. In the book, the best way to get by one is to put a towel over your head so that it thinks it cannot see you (long story…), but there’s no towel anywhere that I have found so far. I experiment with a few objects and discover that if you drop the steak that we found in the Heart of Gold, it munches on it contentedly and falls asleep so I can continue past. Off to the east is Megadodo Publications, the maker of the Hitchhiker’s Guide, but the office contains only a strange here “Neutron Wrangler” that I can pick up. To the west is the headquarters of Sirius Cybernetics where I find a 42-dollar coin. (In the book, neither of these locations had anything to do with Krakafoon.) Just beyond the coin is a great hall where I find the Great Green Arkleseizure, a one-off character from the books that is known for having created the universe by sneezing. Unfortunately, that seems to be a dead end and I don’t have anything that he wants. Uh oh! It’s turning yellow! While I am exploring, I have to keep my Kill-o-Zap on me at all times because the whole planet is littered with Vogons. It feels like this was intended to be the Vogon homeworld, although that is not the case in the books. If you’ve noticed the screen borders, it seems that the more I use or hold the gun, the more the border changes. It starts with blue, but progresses to yellow, then red, then… well, I’m not sure what comes next. My guess is that this is a hint of some kind, probably that the gun has limited charges. I’ll try to be careful using it, but having a color-change meter like this is actually quite clever. I haul all of my new objects back to the Inn, but my score is still a big zero. Unfortunately, I cannot figure out what to do next. The improbability drive (made in Hong Kong!) is obviously for the Heart of Gold, but just dropping it in the Control Room or the Total Perspective Vortex does nothing as pulling the handle still causes me to get sent into space. What am I missing? I have to consult the walkthrough for the third time and find that the answer is to “PUSH” the lever instead of pulling it. Apparently, I was supposed to take a sign saying “Do Not Pull” as a hint. I push the lever instead and end up on Betelgeuse! To the west is a walkway that has a number of shops along it: a “Bistro Illegal” with a fountain in it, “Throat Emporium” that sells chocolate liqueur, and the “Maximeglon Museum”. The museum is guarded by a Suntiger and I have no obvious way to get past him. To the north is “Milliways”, no longer at the end of the universe and now just a plain old bar that sells Pan Galactic Gargle Blasters. Next door is the “Evildrome Boozerama” which has a Nutrimatic drinks machine. Underneath the Boozerama is a steam parlor where I can pick up a towel. Now I am a hoopy frood who really knows where his towel is! When traveling in space, it’s essential to know where your towel is. Dragging my towel back to the Inn, I discover that it is my first artifact! 20 points and one-fifth of the way through the game! 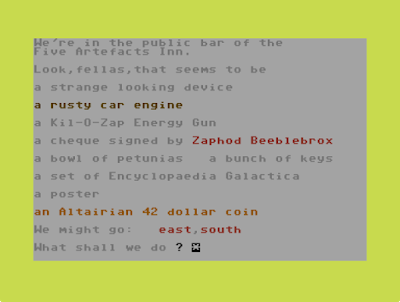 I also discover that I can use the coin from Krakafoon to buy the chocolate liqueur and Zaphod’s cheque to buy the Gargle Blaster. Strangely, after buying the chocolate, the coin is left on the floor. Is it a bug? Or a feature? I pick it back up anyway. I spend some time trying different things with the suntiger, but nothing works. Worse, any object dropped in his room is lost since he doesn’t let me pick them up. I restore afterwards. I eventually find (after a tremendous amount of trial and error) that if I drop the coin in the room with the vending machine, it produces a “cheese-flavored tea”. I had been trying to “deposit” it and lots of similar words. Exactly why I would want cheese-tea, I have no idea. Is that a British thing? This time, my coin stays gone after I use it. I take all of my stuff back to the Inn, but don’t get any more points. With no further avenues to explore, I take my fourth hint: you can scare away the suntiger by reading Vogon poetry. That seems… strange, but I’ll take it. I had assumed that the poetry would be a one-time item to get the ship moving so I have to run back to fetch it. Beyond the suntiger is a museum containing all of the “big” computers mentioned in the Hitchhiker’s trilogy including Deep Thought, the machine capable of answering the ultimate question of life, the universe, and everything. Standing around the room, we get a hint that the neutrons in the room are unwrangled, so I bring in and use the neutron un-wrangler to unlock the next clue: Arkelseizures are heavy drinkers. In the books, the Arkelseizure is an alien deity that is believed to have created the universe with a sneeze. Somehow he seems much more pedestrian now. I rush over and give him a Gargle Blaster, but he just spouts a message containing all punctuation marks (swearing) before falling asleep. What is that about? A room containing Marvin the Paranoid Android. He’s typically moody but any attempt to move him just causes him to complain and leave. I restore back. A “leisure exhibition” that includes a set of peril-sensitive sunglasses and a set of scrabble tiles. If I walk while holding (wearing?) the glasses, everything appears gloomy and I can no longer see the room exits. 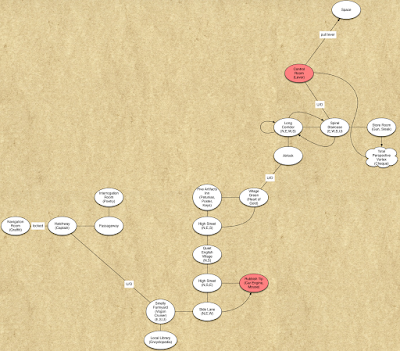 It’s strange, but since I have such a good map I have no problem getting them back to my cache. In the books, these glasses go completely dark in the case of danger. A room containing a babel fish, but any attempt to take it causes it to disappear a turn later. In the books, the fish are used as universal translators: they slide into your ear and you can hear and speak any language. 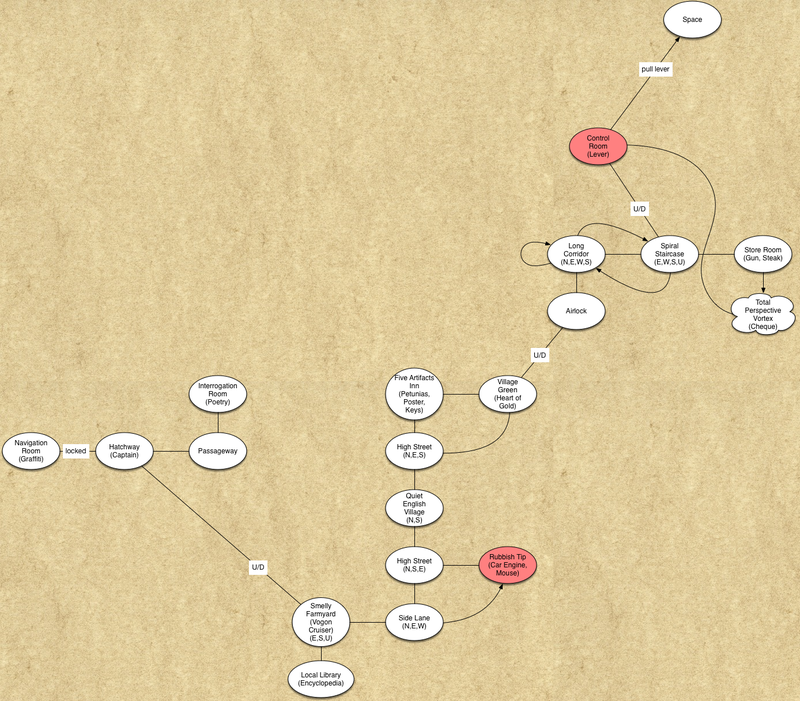 My map of Betelgeuse; extra handy if you are wearing sunglasses! With nothing left that I can work out on any of the three planets, I go into a trial-and-error mode to catch a break. I eventually find that if I feed the cheese-tea to the Magrathean mice, they will let me carry them around. That doesn’t win me anything and I end up taking my fifth hint in frustration: the babelfish likes chocolate! I feed it the chocolate liqueur that I purchased and now I can carry it around. I do not, as you might expect, have to put it in my ear. Now, when I give the Gargle Blaster to the Arkelseizure, I can understand the punctuation! He’s telling me about a secret path to the west and immediately one opens up. Score! Beyond that passage is a new section with a Mint (containing a second coin) and some government offices. A small mirror maze is to the south, but it’s easy to map and contains a copy of the Hitchhiker’s Guide to the Galaxy. To the north is an elephant, but I happen to still be carrying the mice around and they scare him away. At this point, rather unexpectedly, my gun explodes. I haven’t been mentioning this, but every time we go to Krakafoon, I have to keep my gun in-hand and turned on to deal with Vogon patrols. It has to stay on because if you do not shoot them on the first turn that they appear, you will be killed. However, as you have the gun turned on, the screen gradually changes color to red and eventually it explodes. I try restoring back a ways, but it has been a long time since I was in Krakafoon. I end up biting the bullet and replaying the entire game from scratch to minimize turns with the gun on. In my next playthrough, I happen to notice that there is a duck in the steam room where I grabbed my towel before. The towel must have been on the duck and I didn’t notice when I picked it up. Other than that, everything went as before except much quicker. 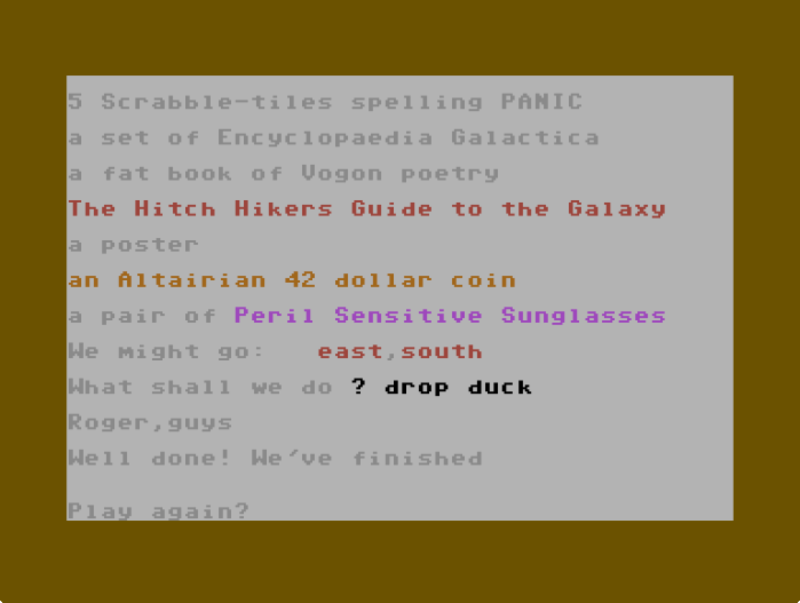 You might be asking yourself why the duck is a key item and not, for example, the sunglasses or Scrabble tiles? I have absolutely no idea. Does anyone remember a duck in the books because I sure don’t. This is likely to be, without a doubt, the most disappointing ending screen of any games that we have played so far. Four words! I know memory was at a premium in those days, but this seems a bit ridiculous. All in all, it wasn’t terrible and I am eager to see how it does in our scoring. It was frustrating but fun enough, especially as the puzzles started to click into place. Before we get there, let’s take a look at the non-Hitchhiker’s version: Cosmic Capers. As I mentioned above, around two years after initial publication, Douglas Adams withdrew his permission for the game leading to a brief court battle and the original being withdrawn from sale. In order to make the best of a bad situation, Bob Chappell and Supersoft quickly rewrote and re-released the game (in 1983 or 1984) as Cosmic Capers, a game completely unrelated to Douglas Adams or his characters. I was able to locate a copy of this game and played it most of the way through. It seems to be in a moderately updated version of the engine, although annoyingly the “L” command is now for loading a saved game rather than looking around. That absolutely kills my finger-memory. As you explore, it’s clear that Chappell essentially did a search-and-replace in the source code: every puzzle is the same, but all of the terms are different. The Heart of Gold has been renamed the Blitish Layland, the bowl of petunias are now pansies. Eddie is now Bugsy! Very curiously, the Total Perspective Vortex is now just the ship’s management quarters and that at least makes discovering a cheque in the middle more sensible. There are dozens of examples just like this. Now here’s the weird thing: this excised version of the game actually makes more sense. I have spoken to Peter Calver, CEO of Supersoft, and he insists that the Hitchhiker’s Guide game came first-- and I believe him-- but still there may be some glimmer of truth that the game was developed with non-Hitchhiker’s puzzles first and had the book’s characters and situations overlaid on top. That is the easiest explanation for why the puzzles are nearly all disconnected from the books’ situations. Sure, feeding the Beast of Traal makes a little sense, but why would a babelfish want chocolate? Or the mice want cheese-flavored tea? I suspect that at least a draft of the game was started without the Guide characters, even if the work was finished after permission was granted. 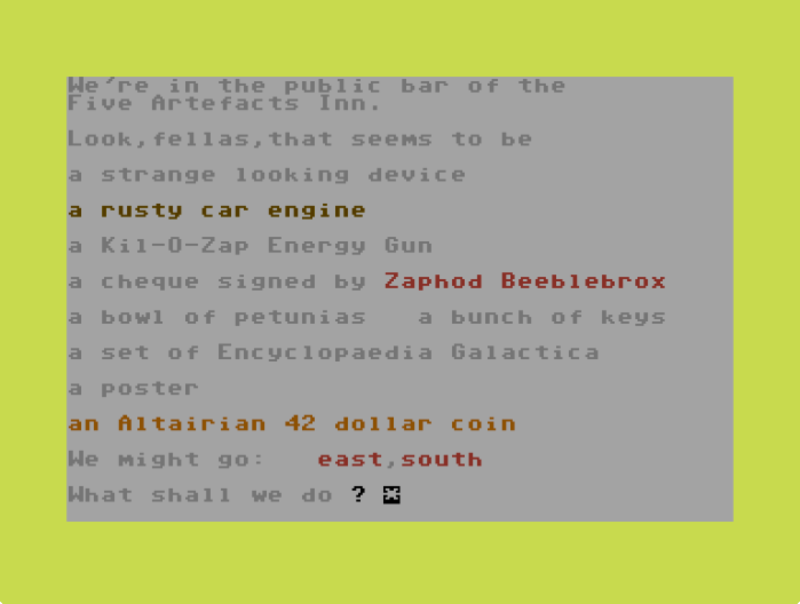 Either way you play it, it’s a reasonable if inscrutable text adventure of its era. Let’s see how it does in our rating system! 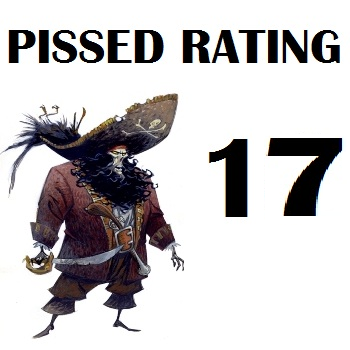 Since every post could be someone’s first post, I should clarify that our ratings are based on an idealized game and we likely will never have a 100. We also do not weight by year so there is a general trend towards scoring older games lower than newer ones because the genre improved over time. Puzzles and Solvability - I’m not saying that they were bad exactly, but too many of the puzzles in this game make little sense or require trial and error. Worse, the use of Hitchhikers Guide characters makes this worse by setting expectations as to how to approach a puzzle while being completely wrong. Why doesn’t the suntiger like poetry again? A few of the puzzles were clever, especially the room where the babelfish would translate Deep Thought’s hint for you, but the time limit on the kill-o-zap gun was an annoyance. Far too many games of this era have time limit puzzles like this, but I will give credit-where-due that it was well-integrated into the game and even had the background color changing as a clue. The lack of any explanation what the special objects are (or even any sense as to why the author would pick some of them!) just added to the frustration. I really want to round up and go with three here, but I cannot convince myself to do it. My score: 2. Interface and Inventory - The parser is serviceable but with some inexcusable little confusions. I’m still peeved about “on gun” being the command to power-up the weapon, but there are many cases where you cannot interact with objects with the nouns you expect. The sunglasses, for example, can only be manipulated by calling them “glasses”. I liked the color-changing borders for the kill-o-zap puzzle, as well as the use of colored text for some items to make things a bit more visual, but the engine never really overcomes its weaknesses. My score: 2. Story and Setting - For a game that is adapting one of the great works of science-fiction comedy, there is surprisingly little story present and I’m still not sure of the point of the game. Each of the game’s three planets (Earth, Krakafoon, and Betelgeuse) have their own personality and they work especially well if you ignore the continuity problems from the books. Textual descriptions were fairly sparse, but you can see potential. My score: 2. Vogons as they appeared in the TV series. Sound and Graphics - The bane of every text adventure game! I’m actually going to give a point for this one for the clever use of the color-changing border to indicate the gun overheating, plus the good use of color in some of the object names and descriptions. 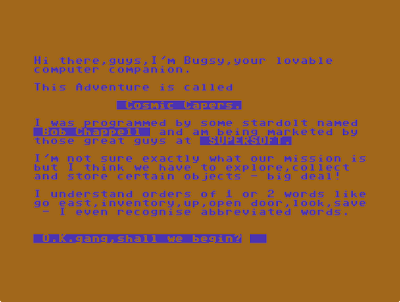 This was a lot more than comparable text adventures of the time that I have played. My score: 1. Environment and Atmosphere - Judging environment is always difficult, but I enjoyed that each of the planets had a different feel. There’s a palpable feeling of tension on Krakafoon, especially with the Vogon patrols, and that whole sequence comes off well. Ultimately this category is let down by the disconnected feelings of some of the areas and the lack of any overriding narrative to draw your attention away from the game’s other flaws. My score: 2. 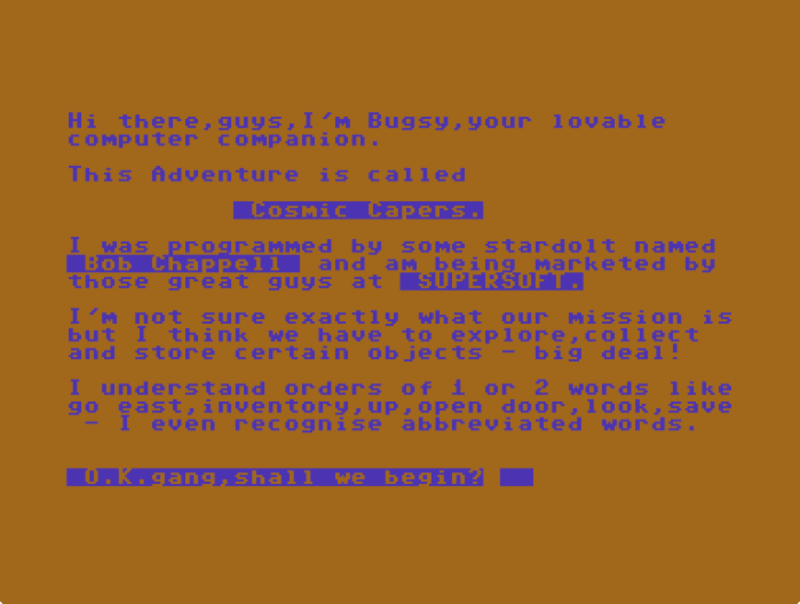 Dialog and Acting - This is often the saving grace category for text adventures, more or less compensating for the lack of graphics, but not so in this case. Text throughout the game is minimal and there is not even any item descriptions. There is barely even enough text to explain what the game is about. Although the game tries to be funny at times, the humor doesn’t make up for the other shortcomings. My score: 1. I was going to take away a discretionary point for the absolute stunner of a non-ending or the fact that the game fails to take advantage of its source material, but on further consideration that seems a bit mean-spirited. Let’s leave the points as they fall. That just leaves the final tally: (2+2+2+1+2+1)/.6 = 17 points! This is a low-scoring game, but that is not surprising for 1981. It is not as well-polished as the Infocom games that were being releasesd at that point, but much closer to par for the two-word parser games that were still common. I had some fun with it even if I couldn’t solve it on my own. I expect that it would have been a better game if it had been allowed to be its own thing, although I doubt it would either have sold as well or been as well-known without the famous connection. In terms of score, it roughly compares to Psycho, Emmanuelle, and Hugo II. Licensed games either retell a popular story or provide a new adventure with your favorite characters. This one is an odd duck because it does neither. Let’s see how the Infocom version compares in a few weeks! "why would ... the mice want cheese-flavored tea?" Mice -> cheese. That's as gentle as 1981 adventure game signposting got. "Why doesn’t the suntiger like poetry again?" 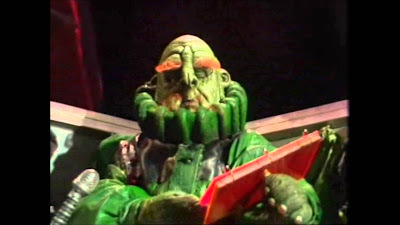 The suntiger might be a fan of poetry generally, but you must recall that Vogon poetry specifically is the third worst in the galaxy. Your overall point stands, I just thought that these specific examples were less baffling. I guess I got hung up on them not really being mice in the book, although I'm not quite sure whether they would have liked cheese tea or not. I totally need to renounce my geek card. And I just re-read the first two books AND the original radio scripts. As an Australian I feel qualified to confirm your guess of what a 'rubbish tip' is. Yeah, it's where your rubbish ends up and also known as a rubbish dump. When I was a kid we used to go there occasionally to throw away large items that wouldn't fit in the bin. Thanks! I really love reviewing games where I can dig into the history and track down the developers. Digging up the obscure is more fun than trying to say something interesting about what Sierra was up to that week. This is the same reason why I love doing the Christmas posts so much. In this case, I am frustrated that I could not locate Bob Chappell. I'm not sure that he would have liked the review much, but he could have answered so many questions about how this came to be. Peter Calvert however was great in answering questions and providing some context. As I go, I also correct credits and things on Mobygames so that things are documented further than just our little blog. Woah, wait, was the other HHGTTG game already reviewed?? The first post of the Infocom review will be coming out next week. I wanted to look at the older one first. Excellent point! That is a quite deep cut, but the game seems to be full of them. - First, a post at this blog linked from TAG has some more in-depth info about the author and the game, and why it was pulled. I love the Antiquarian and provided him some of my research as well. He wasn't able to track down Peter Calvert (which I successfully did) and so I passed along what I learned about Supersoft for some future work that he is doing. I completely missed that Bob was a game reviewer. Now I need to see if I can find a copy of that book... I still wish I knew where he went. His name is too common for me to track him down through social media. I found some meta-data linking him to reviews in older computing magazines, but had trouble reading it. I neglected to bookmark the pages yesterday, but the years were about the same, 83-84. I didn't see any mention of him past that point either. "I have to consult the walkthrough for the third time and find that the answer is to “PUSH” the lever instead of pulling it. Apparently, I was supposed to take a sign saying “Do Not Pull” as a hint. I push the lever instead and end up on Betelgeuse!" I can't decide whether I think this is incredibly stupid or incredibly clever or both at the same time. I would give it more credit for being clever, if it wasn't stacked with the question of what to do with the Improbability Drive. Since it wasn't clear what room the engine needs to be put in, I ended up fumbling with that more than deciding to try "pushing" the lever. But I agree that it COULD have been quite clever with just a tad more of a hint such as perhaps an indication that you had the drive in the right place.